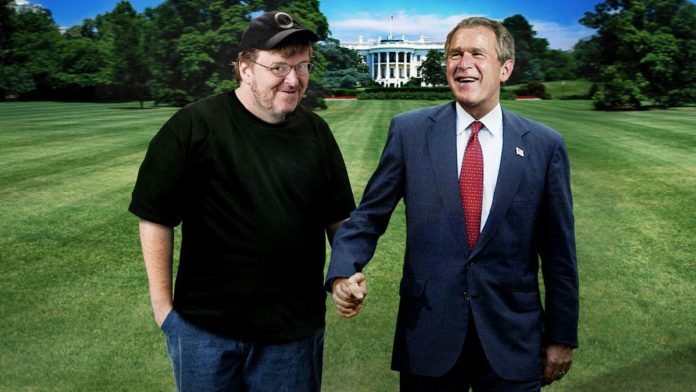 The newly released documentary Fahrenheit 9/11 by Academy Award winner Michael Moore is, and will be, one of the most controversial documentaries in recent memory. Moore shows the political chaos following the world-changing events of September 11th but even more importantly, he shows the toll that 9/11, as well as the US occupation of Iraq, has taken on the American people. The film opened at number one at the box office and earned $23.9 million in its first weekend, making it the highest grossing opening weekend in documentary history. Known for his outspoken politics, including his criticism of Bush during his Academy Award acceptance speech for Bowling for Columbine (second on the list of highest grossing documentaries), Moore’s latest film is his greatest Bush-bashing to date. I do not want to focus too much on the politics surrounding the issues at hand. The people have already made up their minds; many Americans agree with the decisions that were made and many do not. Although the point of this film is to sway voters in the upcoming presidential election, the meaning and overall value of the film surpass its political aspirations. Whether you are a Republican, Democrat, a greener, a liberal, conservative, or a libertarian, Fahrenheit 9/11 is recommended viewing. In all actuality, the more politically motivated parts of the film aren’t its best features. A link is made between the terrorist attacks and Saudi Arabia while connecting the Bush family to the powerhouse ruler Saudi and Bin Ladin families that rule the nation. It then goes further to say that the US occupation of Iraq is an attempt to smooth over the factual evidence convicting Saudi Arabia of harboring terrorists. The film does point out that the Bush administration never actually blamed Iraqfor the terrorist attacks, but it does show that the American people believe terrorism was the reason for our occupation of the Fertile Crescent. Moore claims Bush did not make good choices for purely financial reasons. These highly researched fundamentals of political ideology are actually the biggest downfall of the film. The connections are tedious, drawn out and hard to follow; easily the worst part of the film. But from Moore’s standpoint, and those who are trying to get Bush out of office, it is crucial for American ears to hear the information that was presented. Moore’s controversial subject matter often overshadows his skills as a filmmaker. People are always discussing the issues surrounding the matter but more often forget the groundbreaking concepts Moore has mastered in his documentary making. It is an artist who makes the audience laugh when tears are still wet on their cheeks. He innovates constantly with the integration of pop culture, making his documentaries lively and highly entertaining- perhaps it can be said that Moore is the Quentin Tarantino of documentary filmmaking. His artistic ability and powerful skills elevate Fahrenheit 9/11 into a masterpiece. Anyone who does see it will always remember that feeling in his/her gut; witnessing pure pain from a theater seat. The core of the film, the essence and purpose, shows one family whose son was recently killed fighting in Iraq. His mother is crying, not a silent sob, but a painful, stomach-churning weep. As the sister of a soldier in Iraq, I feel that Moore did an excellent job in portraying the desperation that our families are left in. I have cried like this many times hearing the fate of my innocent siblings and cried more during the film. I was not alone behind me, in front of me, and beside me I heard whimpers and sniffles. I couldn’t believe what an impact the film was having on everyone, not just on me. Politics aside, the war in Iraq is having devastating consequences for American families and this is without doubt the most influential element of the documentary. When I go to bed at night I do not know why my brother is in Iraq. I don’t have any strong conviction about what we are supposedly (or being told that we are) fighting for. My brother tries to call about once a week. It breaks my heart to hear that he, as well as other soldiers as shown in the documentary, also feels the occupation is not necessary given its consequences. An effective tool Moore uses in the film is showing the anti-Bush/anti-war soldiers being forced to fight in Iraq. The opinions of the men in Iraq speak louder than any politician or filmmaker; no one is more qualified to voice an opinion than are these heroes of ours. In the film, Moore asks congressmen to sign up their children to serve in the war. Although this is an extreme measure, he is making an essential statement. It is important to imagine that it is your own family that would be sacrificed. I, as well as many others, feel that the safety and comparative advantages were not considered when soldiers were sent to Iraq. I might be biased considering the love for my brother but I believe that everyone should look at it from my angle. Mooregenuinely argues this point. Whether you agreed or disagreed with Bush’s decision to invade, the outcome and death tolls do not lie and Moore proves this effectively. The documentary goes far more in depth than even this article goes in summarizing it. Other topics discussed are the fraudulency of the war, Bush’s leniency towards Saudi Arabia due to financial interests of his family, and even the military exploitation of the poor in the United States. The two-hour film is overflowing with information but one thing will stand out worthy of remembrance. Michael Moore brought us the pain of an American family struggling with the preventable loss of their son; after seeing Fahrenheit 9/11 a substantial portion of America has experienced their agony.